Titan Comics is continuing to prove that they are the perfect publisher for new Doctor Who stories. The Seventh Doctor #2 is no exception to this. This issue picks up right where the first one left off and show the Doctor continuing his investigation into the downed ancient spaceship in the Australian Desert. It turns out that there are government forces at work that would love to see the Doctor fail and start a brand new intergalactic war. It’s up to the Doctor and Ace to uncover the mystery and find a peaceful solution to the pending conflict. I won’t go into to detail as there is a twist at the end of this book that made me smile so much. Andrew Cartmel is a great writer and it shows in his story. This feels like such a classic Doctor Who story arc from the 80’s. The multiple twists and turns the story takes are wonderful and they feel earned. Cartmel does not make the reader feel dumb nor does he dumb down the story. He is just a fantastic writer and it shows. One more thing, this book is really funny. The comedy hits at the perfect times and it works. I loved this book and I could not find any faults. 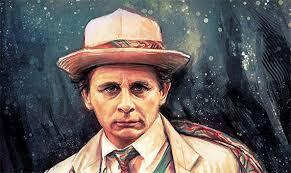 5 Seventh Doctor’s out of 5.